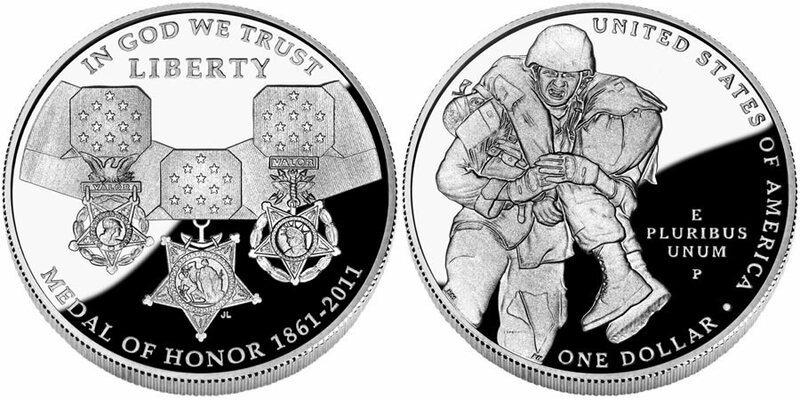 The 2011 Medal of Honor Commemorative Silver Dollar Coin is scheduled to be released by the United States Mint on February 25, 2011. Each strike will be issued by the Mint "in recognition and celebration of the establishment of the Medal of Honor in 1861," according to the Medal of Honor Commemorative Coin Act of 2009 which authorized the coins. The Medal of Honor is the nation's highest award for valor in action against an enemy force given to a member of the United States Military. Since first created in 1861, less than 3,500 have been awarded. These Medal of Honor Silver Dollars will be struck to both proof and uncirculated condition and are part of a larger commemorative coin program which will also include $5 gold coins. Surcharges added to the sale of each strike will be paid to the Congressional Medal of Honor Foundation. The obverse of the coin shows the Army, Navy and Air Force Medals of Honor along with the inscriptions of "LIBERTY," "IN GOD WE TRUST," "MEDAL OF HONOR" and "1861–2011." It was designed by Sculptor-Engraver Jim Licaretz. The reverse shows a modern day infantry soldier carrying a wounded soldier to safety while under enemy fire. It was designed by AIP Master Designer Richard Masters and sculpted by Sculptor-Engraver Phebe Hemphill and also includes the inscriptions of "UNITED STATES OF AMERICA," "ONE DOLLAR" and "E PLURIBUS UNUM."